This Slip n' Slide Mini Play Loft from Strictly for Kids is highly durable, super-safe and ideal for infants transitioning from crawling to walking. Lower hand rails on ramp and exterior tracking rails let children navigate the play loft safely while learning balancing skills. Ramp is fully carpeted for safety and comfort. Features unbreakable Lexan windows, slide with safety barrier and fully sanded and rounded edges to prevent injury. 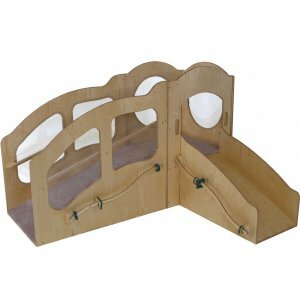 Constructed of Baltic birch plywood for sturdiness and durability, this play loft will last for years and years. Ideal for ages 6-23 months. 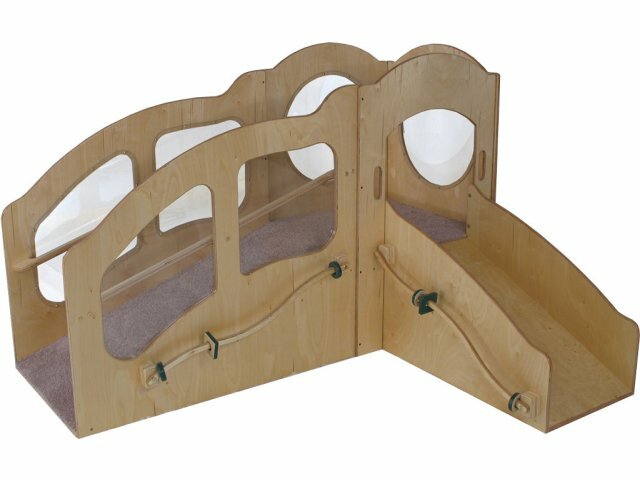 Safe: Fully sanded and rounded edges, safety barrier on slide and both interior and exterior hand rails keep little ones safe. Indestructable: Unbreakable Lexan windows keep children within constant view and provide shatterproof security.